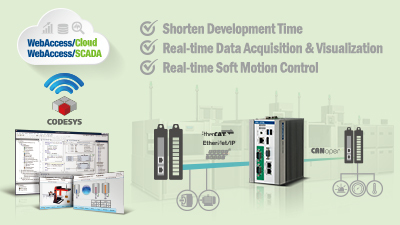 Visit Solution Introduction and Get Free Demo at "http://www.advantech.com/srp/ifactory-fec210"
EtherCAT, EtherNet/IP and CANopen communications. Users can collect data from Ethernet fieldbus and CANopen simultaneously. 402 controllers and virtual axes by certified PLCopen motion POUs. See how this solution: - Shorten Project Development Time Meet schedules by leveraging functional modules from past projects. - Full Integration of Legacy and Successor Efficiency improvements with cost-effective CANopen Fieldbus and the latest Ethernet Fieldbus.